What Is This Strange Giant Sphere in Bosnia? 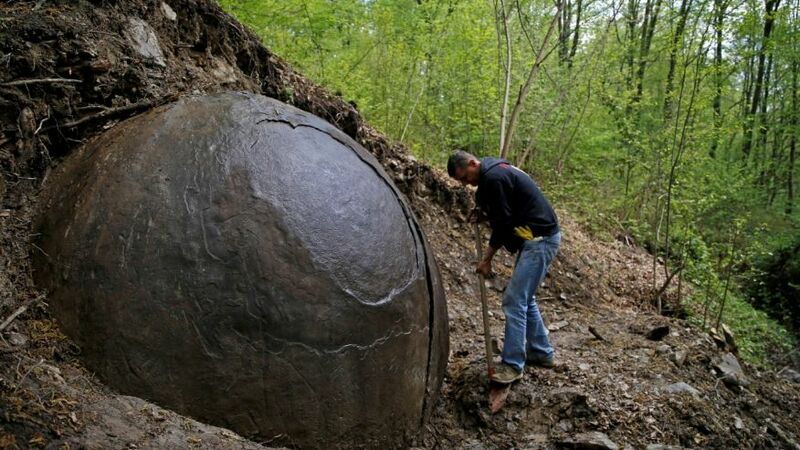 Deep in a Bosnian forest, a man made a discovery of epic proportions — literally! This strange giant sphere has begun to ignite controversy when a researcher, archaeologist Semir Osmanagich, asserted that it might actually be real hard evidence of some sort of ancient civilization, estimating the cannon ball looking sphere to have a diameter of seven to ten feet, made of high iron content, and weighing more than 30 tons. Osmanagich happens to be a highly controversial and heavily debated figure in the archaeological community, so it’s no surprise he would get blowback for his theories about the ball. He claims this finding is one of several near the town of Zavidovici, Bosnia, also claiming that there are as many as 80 of them, or were possibly at one time in the past. He also says this could be the biggest of the spheres in Europe. Other experts are less impressed. They seem to think that it’s merely a result of natural geological processes. One such sphere was emulated for the film Indiana Jones and the Raiders of the Lost Ark and was based on stones that were found in Costa Rica, residing in four excavation sites. These spheres have only been known to be around 8 feet tops. The United Nations Educational, Scientific and Cultural Organization (UNESCO) says the meaning and purpose of these spheres is largely unknown and often debated in the community. A chair of the department of anthropology at the University of Kansas and an expert on the Costa Rican spheres, John Hoopes, told FoxNew that Osmanagich’s sphere looks natural, though the spheres in Costa Rica are definitely man-made. How can he be so sure? Once the sphere is completely dug out of the protruding land mass in which it was found, we’ll have a lot more information..